The 11-day old Moon, showing the prominent crater Copernicus left of centre, and the bright arc of Sinus Iridum near the terminator. The image was captured on 2013 March 22 by Willem Buys using a cellphone held up to the eyepiece of his 4-inch Celestron NexStar 4 SE telescope. Probably the most obvious feature of the Moon is that it passes through a number of phases from New Moon to Full Moon and back again. The angle from which the Sun illuminates the Moon is constantly changing, so the Moon goes through a cycle of phases of shadow every 29.53 days (synodic month). The Moon makes a full circle relative to the background stars every 27.32 days (sidereal month), moving its own apparent diameter (about half a degree) in slightly over an hour. This motion is particularly obvious when the Moon occults a bright star or planet. 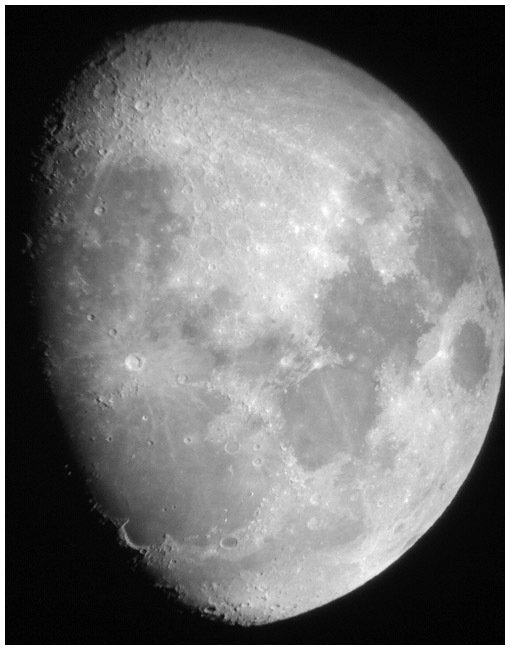 With modest optical aid, many surface features are visible on the Moon. There are light-coloured highlands, interspersed with darker and less rugged low-land plains. The plains were, in the 17th century, believed to be seas, and ever since they have been called mare (Latin for sea; pl. maria). The oldest and largest features are the impact basins, huge multi-ringed crater structures forming ridges and mountains, several hundred kilometres in diameter. There are more than 300 000 lunar craters over 1 km in diameter. The line separating sunlight from shadow is called the terminator. It takes some two weeks to move across the Moon’s visible surface. Through a telescope, movement of the terminator can be seen in a few hours by carefully studying mountain peaks and the insides of craters. More detail is visible near the terminator than anywhere else. Many craters turn into white spots, or disappear from view entirely, when lit directly from above, as at Full Moon.